Winter has already disappeared here and we’ve been enjoying white and pink blossomed trees for a few weeks. We can finally go out just with a T-shirt and I love it! I love a lot of other things indeed when winter’s gone. I feel renewed and have more energy for everything including cooking and baking. 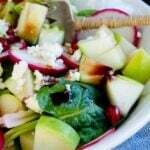 It’s the freshness time of year again, so something fresh on the dinner table gives everyone a similar feeling. 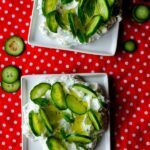 Cucumber Yogurt Feta Dip is made exactly for this purpose and it completes the mission successfully! We can have cucumber at any time of day when it’s in season. It is like a must in a typical Turkish breakfast along with sliced tomatoes. The fresh scent of cucumber in the morning definitely has a stimulating effect on me! One of our most popular cucumber dishes is Cacik, which is a wonderful combination of cucumber, yogurt and garlic. We have it as a side dish in summer. 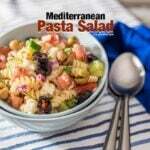 It goes wonderfully with with Easy Meatballs with Potatoes. The other one is Shepherd’s Salad, which is a tangy salad mostly paired with kebabs. Actually I don’t need anything to pair with these, I love to have them as a snack too. This cucumber yogurt feta dip is my third favorite. If you love to snack on chips with a dip sauce when watching a movie, I’m 100% sure that you will love this healthy cucumber treat. You should slice cucumbers very thinly to give them a look of chips. 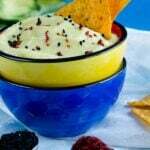 Make them stand on the yogurt dip vertically and dip cucumber slices into the yogurt dip when eating. Enjoy! I’m so much intrigued by these Cucumber Canapes and I will try it soon. Go check it if you love recipes with this refreshing vegetable! A tasty yogurt dip with cucumber, fresh mint and feta. Serve it with cucumber rings. Mix strained yogurt with 3 tbsp water in a bowl with a fork until smooth. Chop one of the cucumbers finely and toss in the bowl. Stir in minced mint and feta. Mix them well until combined well. Share on plates or small bowls. Slice the remaining cucumbers in thin circles and maket hem stand on the yogurt mixture. Drizzle over olive oil before serving.